Graham Arnold plans to shake up the Socceroos approach. IT'S all the rage across Europe's biggest clubs and now the 'front three' is heading Down Under to solve Australia's goalscoring woes. Attacking trios are the formation of choice at heavyweight teams such as Liverpool, Barcelona and Paris Saint-Germain, as global football steers away from lone striker formations. The Socceroos' lack of a proven international marksman - with the exception of Tim Cahill - has long been an issue for the national team. None of the squad picked for this month's friendly against Kuwait had notched more than 10 goals in the green and gold with Tomi Juric and Mathew Leckie's eight strikes the most for any player. 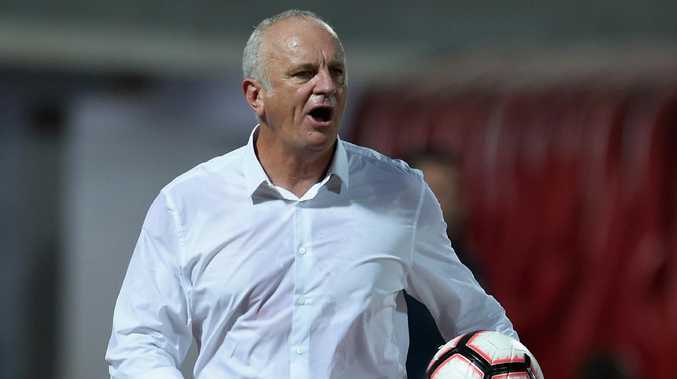 Celtic's Tom Rogic joined that pair on eight international goals with the third strike in Australia's 4-0 victory in Kuwait City, which marked the start of Graham Arnold's second stint era as full-time Socceroos coach. The use of three forwards in that win is part of Arnold's plan to help Australia find the back of the net more regularly before their Asian Cup defence in the UAE in January. 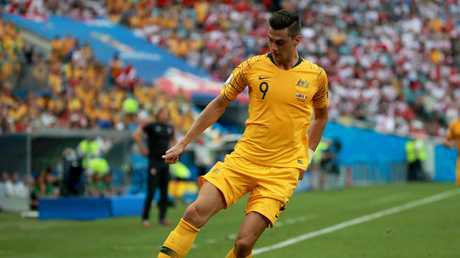 They may not be Liverpool's Sadio Mane, Mohamed Salah or Roberto Firmino, but Arnold believes he has the talent at his disposal to overwhelm defences and wants to give players like Rogic, Leckie and Robbie Kruse the licence to attack. Tomi Juric is among the goal-scoring weapons for the Socceroos. "We have the players, it's about giving them the freedom to express in the final third and I expect that," Arnold said. "You would've seen with Kuwait that I'm more or less playing with three No.9s, with the wingers very narrow and coming inside because it's a shorter route to goal and our fullbacks are much higher. "You see Tommy Rogic scoring more or less every week with Celtic, you see (Aaron) Mooy doing what he does at Huddersfield and you see all these boys - it's about just letting them, nearly, play in the backyard." The Socceroos will play their first home match in a year against South Korea on November 17 in Brisbane, in a replay of the 2015 Asian Cup final, before they face Lebanon in Sydney three days later. Arnold said the chance to showcase his new philosophy to home fans is exciting and he'll be sticking with the same mentality as he did for the Kuwait match, despite Korea's much bigger international reputation than the Middle East minnows. "The boys walked off the pitch seeing that what we worked on in training, it doesn't matter the calibre of opposition, it's about the understanding of it - that it works," he said of the Kuwait win. "I'm excited for this camp with the stronger opposition in the Korea Republic to work on that even more."